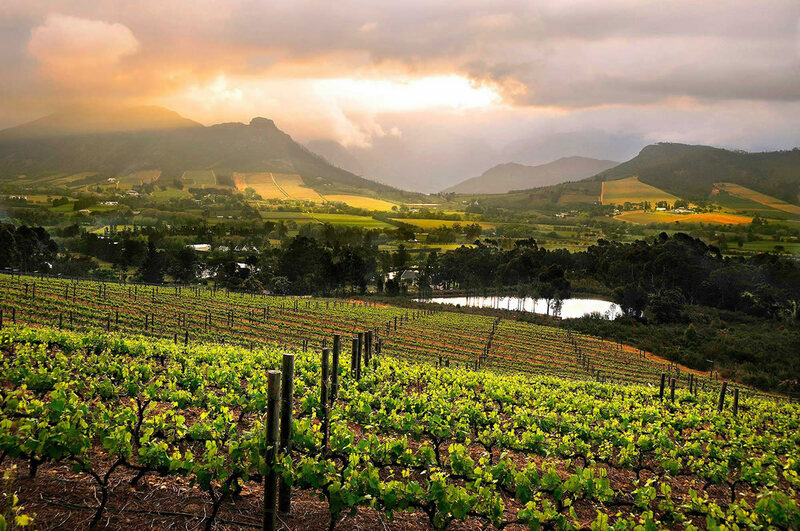 The Cape Winelands in the Western Cape, South Africa are nothing less than paradise on earth. The clear blue skies look down upon the lush green countryside. The fresh air and surrounding mountains are a treat to one’s senses. From long regimented lanes of vines, laden with ripe grapes to the wine cellars offering a huge variety of wines from the current year as well as many acclaimed labels of former years. Whilst at the Atlantic Breeze Guest House, the Wine Route is close at hand – indulge in nature’s bounty at its best. Visit the wine estates, embarking on an unforgettable journey along the oldest wine routes in the area. Wine tasting, cellar visits or just a stroll in the vineyard, the possibilities are endless. You will also find centuries old, amazing architecture in the neighbouring towns. Spend a day in Paarl for an opportunity to taste wines from the famous Nederburg Estate or the renowned Fairview Wine Estate and Goat Shed Restaurant. Many wineries also have excellent restaurants attached. If you are looking for adventure, then take out your hiking gear and head towards Paarl Rock. Spend a day hiking or mountain biking in Paarl. Here you could also witness beautiful pieces of 17th-19th century Dutch architecture. Scenic drives and bicycle trips along oak-lined streets are also a great way to spend your time while in Paarl. Nelson Mandela was imprisoned in Paarl, and today a bronze statue stands outside his prison, the Victor Verster Correctional Centre, as a testament to his efforts. Paarl is also famous for the “Afrikaanse Taalmonument” or the “Monument to the Afrikaans language”, the Language Museum and the Afrikaans Language Route through Dal Josaphat. Another must-see site is the winelands of Constantia, one of the oldest suburbs of Cape Town. It boasts of centuries-old wine estates and exquisite restaurants like Simons, found at Groot Constantia, La Colombe and River Café at Constantia Uitsig. The wine route of Constantia is an experience of its own kind, with Baroque and Cape Dutch architecture. If you are a flowers person, then Robertson is your destination. Commonly known as the Valley of Wine and Roses, it’s a picturesque town with tree-lined streets and several interesting national monuments like the Pink Church built in 1859, the Powder House which was originally a storage for gunpowder, and a few magnificent Edwardian and Victorian era buildings. Another place to visit while in the Western Cape is Durbanville, a fusion of modern lifestyle and the old-world charm. You will find world class shopping centres close by and still enjoy the peace and tranquillity offered by rolling wine estates and astounding mountain views. Whilst in Durbanville, feast your eyes on historic architecture like Rust En Vrede; Onze Molen (a restored mill); Kings Court; Dutch Reform Church; All Saints Church and the Synagogue. You could also visit Stellenbosch, the City of Oaks, famous for its wine estates, picturesque buildings and old oak trees. In short, you will find the wine lands to be an enchanting place that leaves an everlasting impression on the heart and soul. This natural wonder has captivated both the palates and minds of many for generations and your visit will become a pleasurable experience that will stay with you for a long time.